Most Efficient Kit Kat Fuses! 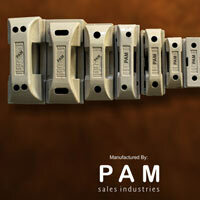 Pam Sales Industries is a renowned organization dealing as a foremost Manufacturer and Supplier of Kit Kat Fuses. These Kit Kat Fuses are extensively used in House, School, Colleges, Factories, Agriculture, Farmers and many other places. Offered in different sizes, our Kit Kat Fuses are in compliance with international quality norms for safe and durable usage. We supply our Kit Kat Fuses all over in the Indian markets. We have been in this field of Kit Kat Fuses manufacturing from almost three decades and have gained vast experience in understanding the needs of the market. Our Kit Kat Fuses are made as per the industry standards thus highly demanded in the market for their excellent make, smooth functioning and safe usage. We work with a client centric approach and make sure that the clients are offered with the ultimate customer satisfaction by providing them the best Kit Kat Fuses at economical prices.